I'm not too picky when it comes to describing nice weather. I want comfortable temperatures, no storms, and comfortable levels of humidity. I do get picky though when describing the weather on a perfect day, which includes temperatures in the low 70's or upper 60's, low humidity, a gentle breeze, and generally blue skies but with just enough clouds to keep it interesting and give some intermittent shade. These are stereotypical spring or fall days in my opinion. In Kentucky we truly do experience all four seasons, though I often wish spring and fall would last longer than they do; if we do happen to get a perfect day, then I want to make sure I fully enjoy it. We recently had one of these perfect days, and the timing could not be any better because my Crimson Lotus Tea order has just arrived with their 2015 teas. On this perfect day I knew exactly what tea I wanted to brew. 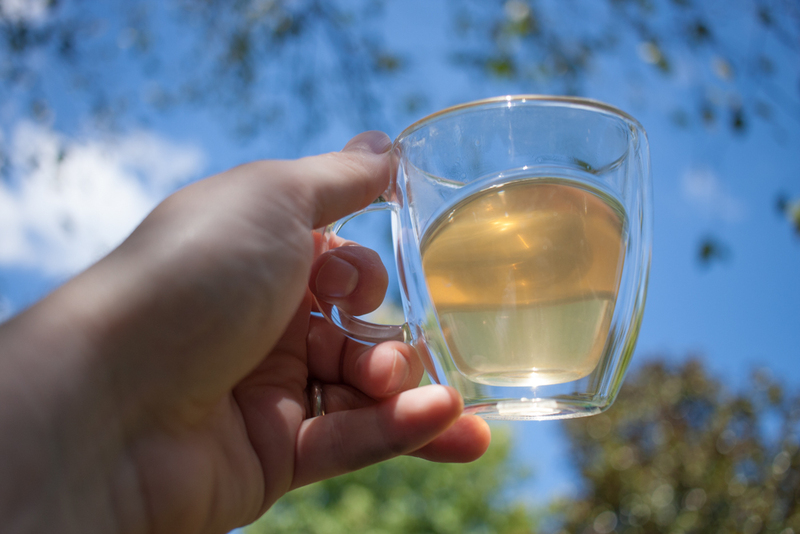 Though based on nothing more than a non-scientific gut feeling (since I had not tried any of these new teas yet), I knew that the perfect tea for this perfect day would be Whispering Sunshine. 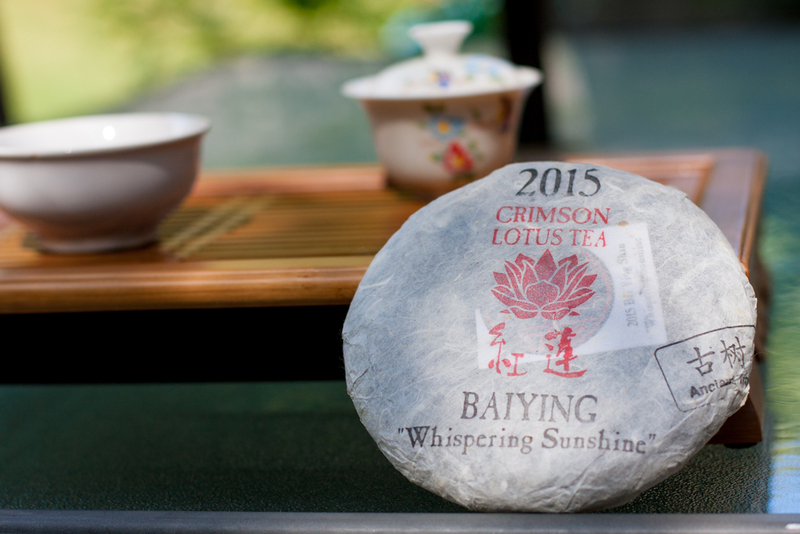 Crimson Lotus sourced the material for Whispering Sunshine in person earlier this year and pressed it in China before returning home to Seattle. 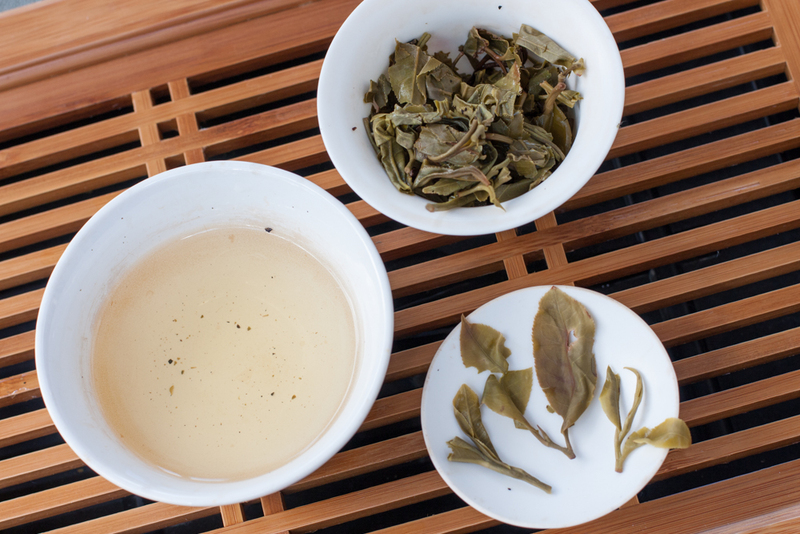 They report that the leaves were harvested by hand in Bai Ying Shan (Lincang) and hand processed into mao cha by tea producers in the He Tao village. Crimson Lotus chose the name for this tea because of Bai Ying Shan's high elevation which exceeds 2000 meters; so high that the "tea trees were close enough to hear the gentle voice of the Sun." On this perfect day I found a long extension cord (despite discouragement from the kettle manufacturer) so I could set up a nice gongfu session outside on the patio. The birch tree in the yard provided some cool shade yet the gentle breeze moved through the branches just enough to allow a few rays of warm sunshine to float down to the ground and dance across the tea table. I couldn't think of a more perfect way to admire this tea. 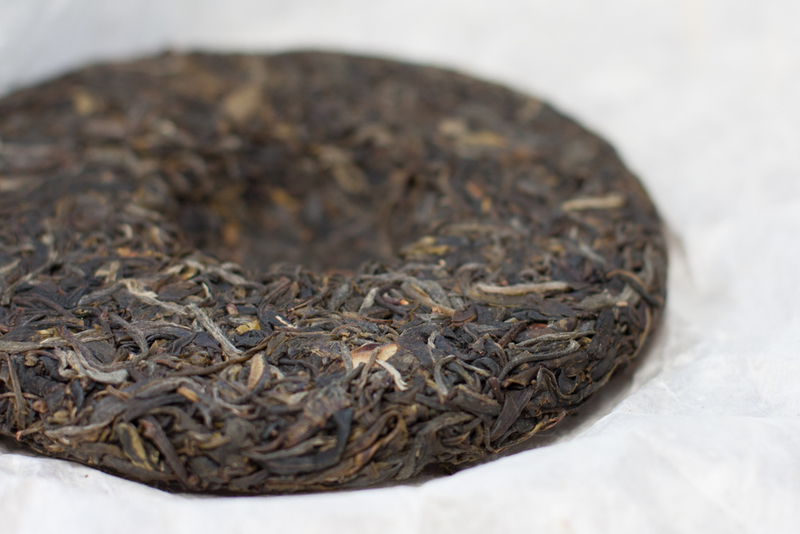 The compression of this sheng puerh cake appears pretty light from the outside, but upon further picking it seems to be more dense than first though. This may be a good balance of being loose enough to pick apart without doing too much damage yet tight enough to help lock in some of the fresh aroma, though after an initial rinse it still may be helpful to tease apart some of the tighter leaf clusters to help with more consistent brewing. I have brewed this more than once by the time of editing this writing, and I found that using water around 200F/93C degrees results in almost no bitterness, though near boiling will give it a bite that some people prefer. I also found that if you want low bitterness yet strong body, adding an extra gram or two of leaf than usual in addition to using 200F water works out great. Whispering Sunshine brews up a yellow liquor that is slightly cloudy due to leaf fuzz, and if the light catches it just right it can give off a pleasant warm golden glow. The mouthfeel is soft yet thick enough to coat the mouth with lots of flavor. Although the initial taste has a hint of smoke from the wood-fire processing, the tea overall is extremely clean and fresh tasting. The amount of leaf used will make a difference, but Whispering Sunshine has a very light and delicate flavor. It has some vegetal characteristics, however not that of bitter leafy vegetables but that of green beans fresh from the garden and sweet peas. This is beginning to sound like the flavor profile of a green tea, and the first thing I thought of when drinking Whispering Sunshine was that it reminds me of fresh Huang Shan Mao Feng green tea, with a floral aftertaste and honey sweetness similar to a high mountain oolong and a hui gan you would expect from a high quality puerh. As the tea cools it reveals a subtle petroleum taste like that of a Riesling white wine, and at one point the freshness and cleanliness of this tea simply made me think of clean linens hanging on a line outside to dry in the afternoon sun. There are some puerhs that are hard to judge (at least for me) when they are this young because they could be fairly bitter and strong and are hopefully going to improve after years of age, and then there are others which are extremely good right away and may be best consumed now rather than later. To me, Whispering Sunshine has a perfect "drink me now" flavor, and I imagine that I will probably end up drinking through the entire 200g cake before having a chance to see how it will do over time. Is this the perfect tea for a perfect day? I believe the tea alone has the ideal flavor profile for a perfect spring or fall day, so yes, it must be, but all the additional information that Crimson Lotus has shared about this tea is really what solidifies the distinction. If you have been following Crimson Lotus through their various social media accounts, you know that they gave weekly if not daily updates about their travels throughout China earlier this year. I may never get a chance to visit Lincang, but I am very thankful that Crimson Lotus shared photos and stories while they stayed in places such as the the He Tao village. The more we can learn about the tea that we drink, the better we can understand the cha qi held within its leaves. When I sit on my patio and drink Whispering Sunshine on a perfect day I feel the calm Kentucky breeze on my face, but when I close my eyes I imagine myself standing on the steep northern slopes of the Bai Ying mountain. The rustling leaves I hear may be my birch tree behind me or my maple trees that were planted about 20 years ago when my house was built, but maybe I'm hearing the leaves of ancient tea trees that have been growing in a remote forest long before I or anyone I know was alive. Is cha qi simply the energy we get from caffeine and theanine, or is it the energy represented as experiences that ancient trees have accumulated over centuries of growth while watching the world change around them? Perhaps a part of cha qi is simply an acknowledgement that energy has been transferred to us through the consumption of the tea; an energy that was transferred to the leaves themselves through chloroform, photosynthesis, and rays of whispering sunshine.